Recent research has shown that well over 2.2million Nigerians are currently displaced I internally across the country, causing unwarranted spilling over to other neighbouring African countries such as Cameroon, Niger, Mali and Chad. The laxity on the part of Government in alleviating the sufferings of these important families (IDPs) against the background of 180million Nigerian population has become a major issue. However, overdependence on Government to do everything could be a major demerit in a democratic society such as Nigeria. Therefore, It would take some support and collective efforts from fellow citizens such as you and I and other well-meaning Nigerians both home and in Diaspora to restore the dignities of these IDPs back to them. All these supports would go a long way in extending love and restoring some hope to these people/families. The passion to restore those once lost dignities back to these IDPs has prompted the synergy amongst SUM ENTERTAINMENT, GOLDLYNX MEDIA and Dotunroy.com. These three frontline organisations based in Abuja with support/collaborations from other partners such Paulash Community Development Initiative and ClickonVenue.com to launch The Abuja Charity Carnival 2016 Roadshow. Jakins A. Jnr, Project Manager for this powerful initiative, Abuja Charity Carnival declared that the Charity Carnival is first of its kind that will be happening within the Abuja, Federal Capital Territory and its environs. "It has come to our understanding through several researches that most of the IDPs within the Federal Capital Territory live in squalor and pitiable conditions, where most of them lack access to basic infrastructure/amenities such as clean potable water, clean toilets, decent accommodation as well as healthcare services " he alluded. Jakins explained the importance of The Abuja Charity Carnival 2016, that it is a non-profit event aims at giving the IDPs the true sense of belonging which they deserve just like every other Nigerian and also to put smiles on their faces by meeting their needs with the proceedings realised during the Charity Carnival. Top music and comedy acts in Nigeria and international have been scheduled to entertain the IDPs and the audience at the event. 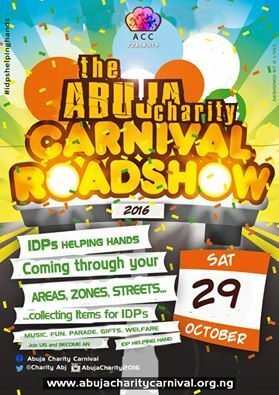 According to Dotun Roy, the Publicity Manager, Abuja Charity Carnival, 'The Roadshow Truck and participants will be parading through Area, Zones, Junctions and malls on Saturday 29th October, 2016 within the FCT to collect any useful item that you wish to give in support of the IDPs. 'The scheduled route for the Carnival Trucks include The Kick Point is millennium park, MTN junction, Banex unction, was Market, Wuse zone 3 Junction, Area 10 junction, Area 1 Shopping Complex, Rita Lori Hotel back to millennium park' he added. So get involved and show love to the needy! Also come and have fun and make life better for one another!